Bobby Capps is looking for thirteen people to go with him to a Sacramento Kings game. He needs (7) Men 5'10"- 6' with long dark hair and/or beard to dress like Tommy and 6 Men 5' 5''- 5' 8" medium length dark hair to dress like Cheech. They must buy their own tickets, but we will all sit together for a little card flipping at Arco Arena in Sacramento, during one of the Kings televised games. The actual date has yet to be decided. Cheech Marin will be starring the new John Grisham adaptation, Skipping Christmas. Joe Roth is directing the film which also stars Tim Allen, Jake Busey, Jamie Lee Curtis and Dan Aykroyd. In Skipping Christmas, Tim Allen portrays Luther Krank, a man who decides to skip Christmas and go on vacation with his wife. Jake and Cheech take on the role of neighborhood cops. Production starts in April and is set for Christmas 2004 release. Chicano, an unprecedented art exhibition, will make its first visit to the Golden State at the Museum of Contemporary Art San Diego (MCASD) in San Diego, Calif., on May 30, 2004. Chicano is a five-year, 15-city national tour that is collectively made up of two major exhibits: Chicano Visions: American Painters on the Verge, a traditional art exhibit, and Chicano Now: American Expressions, an interactive multimedia exhibit for families. Chicano will remain on display at MCASD through September 12, 2004. California Governor, Arnold Schwarzenegger, will be one of Jay Leno's guests on March 1st's The Tonight Show. We are going to pack the audience full of Free Tommy Chong supporters. 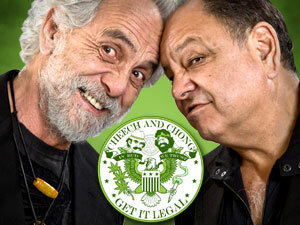 We want everyone wearing a Free Tommy Chong T-Shirt. Once Arnold comes out, we want people shouting "Free Tommy Chong." We want Arnold to get President Bush to pardon Tommy. Tickets are free and are handed out at 7am. The line begins forming around this time. there are only 350 tickets so get there early. People are let inside at 3pm. Bobby Capps and Stonerdude will be on-hand causing trouble. In a free society, a man should be free to do as he chooses so long as he harms no-one. It is our firm belief that Mr. Chong has harmed no-one, and is being unfairly targeted for prosecution because of his celebrity status. Join our movement to stop this travesty of justice! On March 26, 2004, a concert is being held to raise signatures and awareness on behalf of Tommy Chong. We need your help. So, come out to The Road and help support Tommy Chong while having a booty shakin’, rockin’ time! Like a modern-day Jesse James and Billy The Kid, Bobby Capps and Stonerdude covered California's Blue Canyon with Free Tommy Chong protest signs. They once again had to operate under the cloak of darkness in adverse conditions. Contact Bobby Capps if you'd like to participate in their next endeavor.